On the eve of the Grammy Awards, Jimmy Kimmel broadcast his "Mean Tweets" segment. 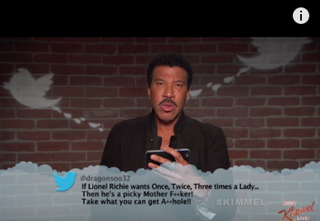 Various singers, including Lionel Richie, Ricky Martin, Common and Drake, appeared on Kimmel's late-night show and read some of the meanest tweets sent to them by those who hate them the most. This goes to show that no one is immune to trolls.